My little brother, Ian, was actually the first person to introduce me to the Cuban sandwich. I had seen it on restaurant menus from time to time but thought they just didn’t sound all that great until Ian ordered one and offered me a taste. Delicious! Unfortunately, prepared that traditional restaurant way they just aren’t very healthy or economical in terms of calories. Hefty amounts of pork, thick sliced ham, lots of cheese, thick cut bread smeared with butter so it toasts up nice in a panini press – you see where I’m going, right? Only people built like my brother and John – skinny with the metabolisms of race horses – can really enjoy these on a regular basis and not worry about gaining weight. Thankfully, the internet is littered with wonderful people who can take great, not-so-good-for-you recipes and turn them into just as great, much healthier recipes. That’s where this one comes from. A friend recommended this blog on facebook and I began to hunt through the wonderful recipes I found there. 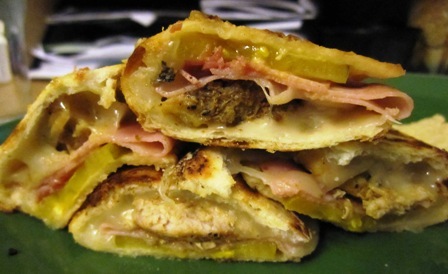 This Cuban Sandwich Quesadilla recipe popped up and I knew I just had to try it. I wasn’t disappointed. With all the flavors of a traditional Cuban sandwich but a mere fraction of the calories and fat, this snazzy quesadilla is sure to impress. Almost needless to say, this was wonderful and so easy to make, I know John and I will be eating them again and again. NOTE: I modified the recipe a little bit to better fit some ingredients I had on hand, but not so much as to change the big picture. I will make notes below to indicate my substitutions. Spray with cooking spray and place tortilla on pan. Each quesadilla is one serving.